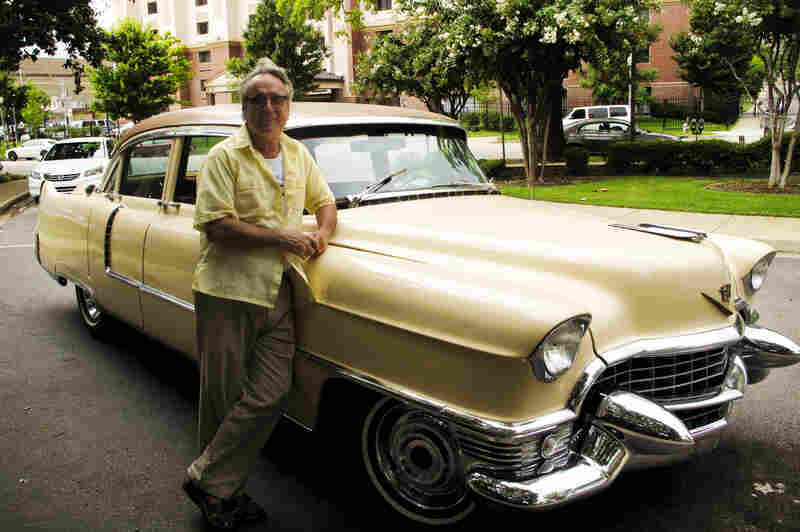 The Vintage Cadillac With The Memphis Soundtrack Tad Pierson has made a career out of his love for cars and American music. He says there are "fewer and fewer real-deal places to go and hear the real stuff," but it's his job to find and share it — one carload of listeners at a time. American Safari tour guide Tad Pierson stands beside his 1955 Cadillac. 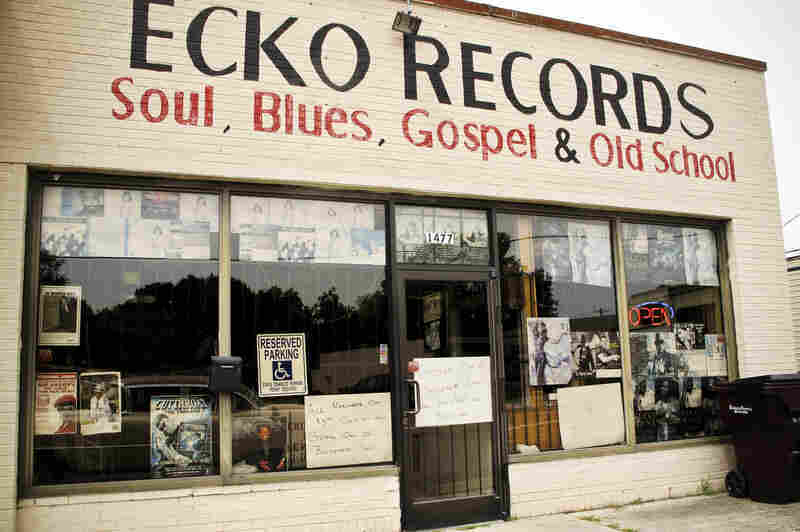 Visitors to Memphis can get a personalized tour that highlights the city's rich music heritage. 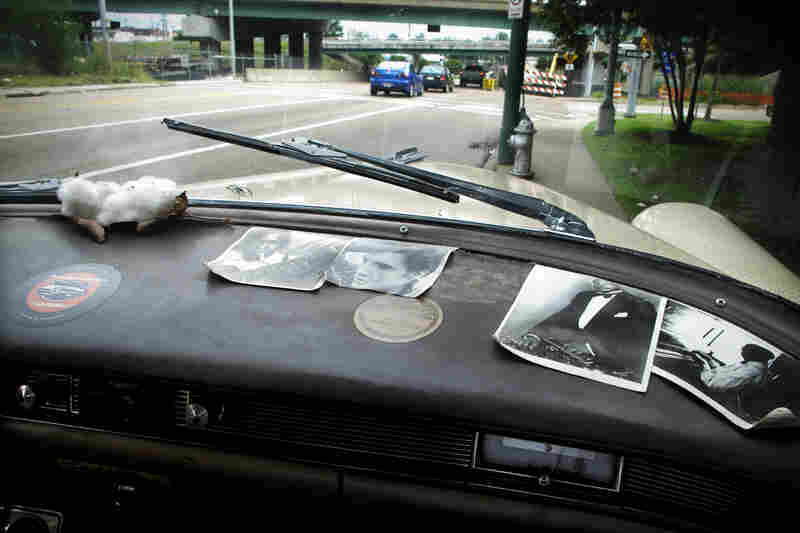 Photographs of famous Memphis musicians clutter the dash of the vintage car. 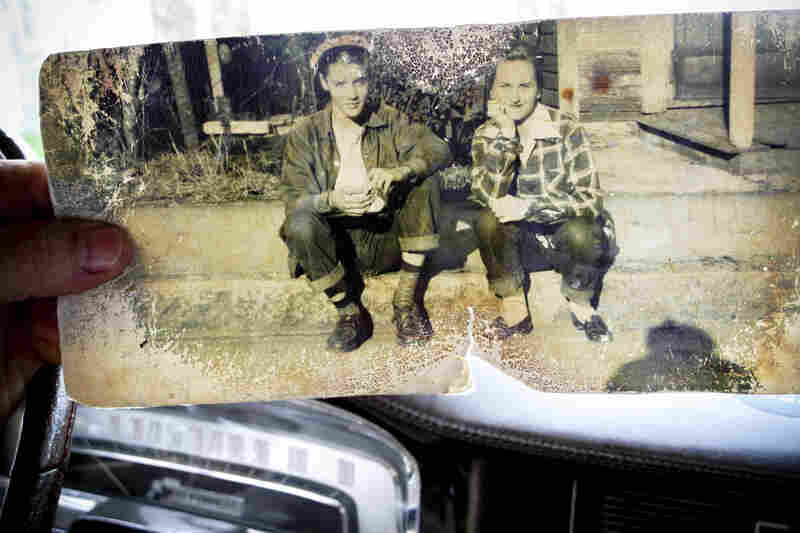 Pierson shows a photograph of Elvis Presley and Betty Ann McMahan sitting on the curb across from the Lauderdale Courts housing project where the Presley family lived from 1948 to 1953. 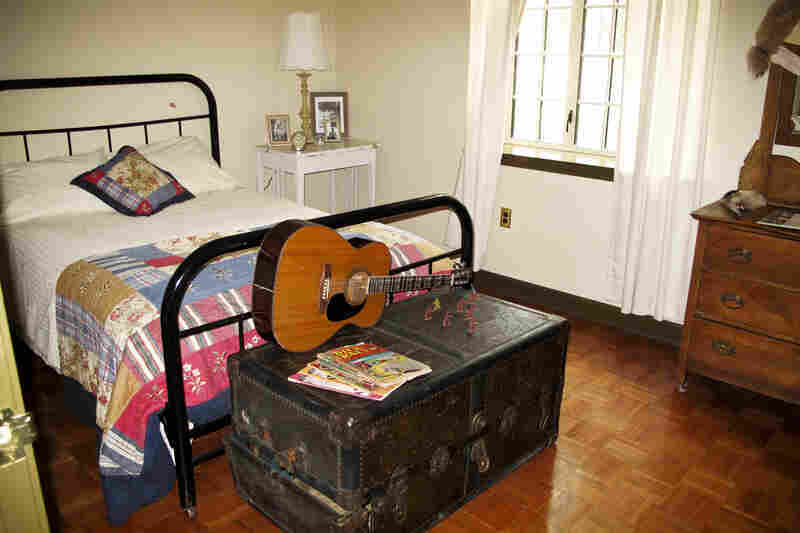 The Lauderdale Courts apartment where Elvis shared this room with his grandma Minnie has been restored. Fans can actually rent the apartment. 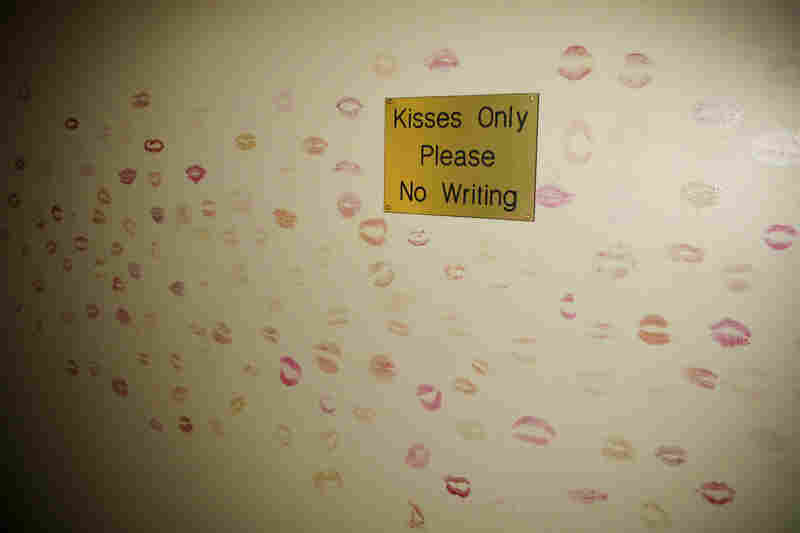 Elvis fans leave lipstick stains on the wall of the bedroom where he spent his teen years. Pierson encourages visiting blues aficionados to check out The Big S. He says it typifies the Memphis blues culture where locals come to dance to tunes on the juke box. 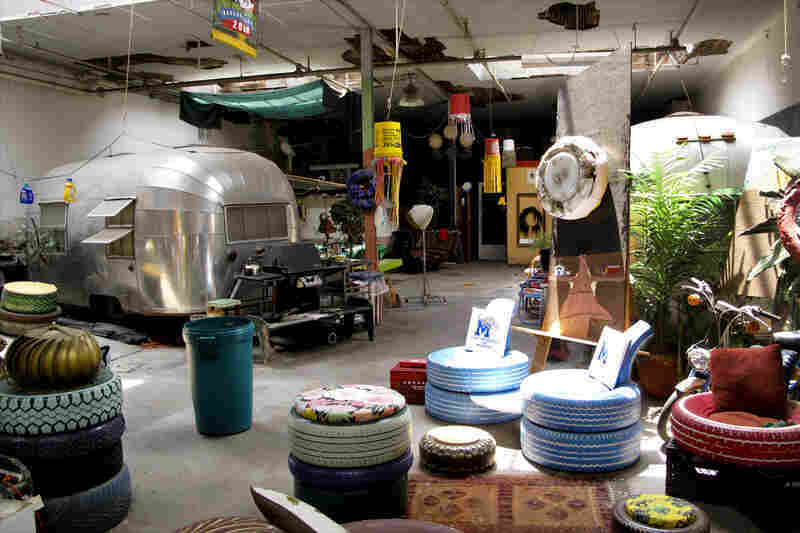 Tad Pierson lives in a converted garage in downtown Memphis, and sleeps in a vintage Airstream trailer. When Pierson isn't touring in his vintage Cadillac, he collects discarded tires from the Memphis landscape. 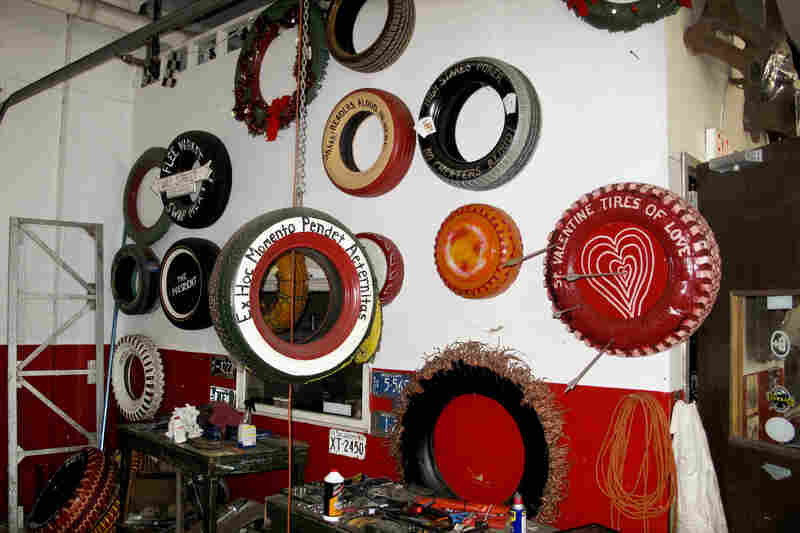 He transforms the tires into chairs, ottomans, wall hangings and folk art pieces. 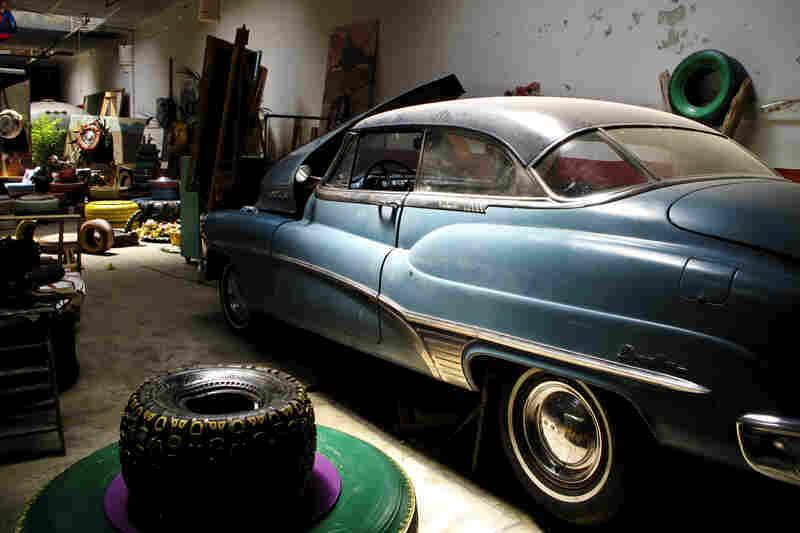 The car that started Pierson's love affair with antique vehicles: his grandfather's 1950 Buick. 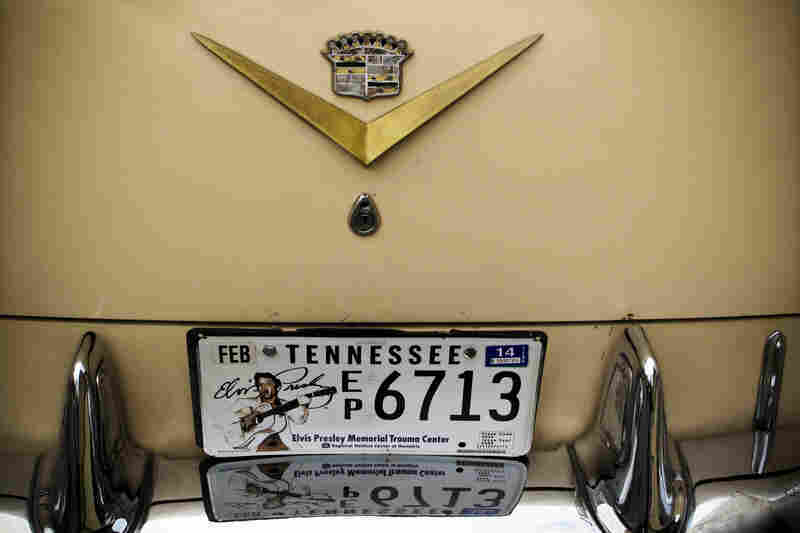 Pierson's '55 Cadillac tends to draw attention as he travels Memphis streets, adorned with a King of Rock 'n' Roll vanity plate. In the town where I grew up — Memphis, Tenn. — Tad Pierson has made a career out of his love for cars and American music by working as a tour guide. We meet in the grand lobby of the Peabody Hotel, the downtown landmark famous for its ducks and Southern elegance. But it's also considered the starting point of the Mississippi Delta, a region steeped in the blues. Parked along the curb outside is not just any '55 Cadillac. It's pink and authentic, with fading leather bench seats and no air conditioning. So we head out, windows down on a thick, steamy August morning. Before we've made it a block, the scent of wood-smoked BBQ wafts into the front seat. "Man, you know I love the smell of Memphis," Pierson says, "and the sound of Memphis." Blues, soul, funk, gospel and rock 'n ' roll all have roots here, but one name is by far the biggest draw: Elvis Presley. Pierson's Cadillac might be pink, but don't expect him to take you to Graceland. His American Dream Safari starts at Lauderdale Courts, the former housing project where Presley lived as a young teen, sharing a bedroom with his grandma Minnie. "Elvis is sort of a prism through which we can look at the American Dream," Pierson says. 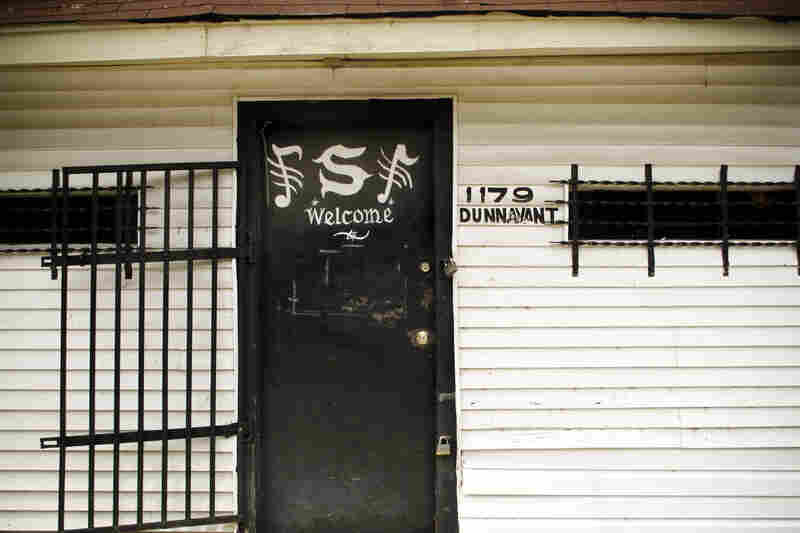 After seeing the King of Rock 'n' Roll's humble beginnings, we head to the south side, home to the legendary Stax Records and some Memphis originals. We pass the church where Aretha Franklin's dad was a preacher, and the boarded-up clapboard house where she was born. "What I have to deal with in my business is what I call 'cultural collateral,'" Pierson says. "I rely on real things in real culture to inspire my customers." But he's seen some of it fading in the 18 years he's been giving tours of Memphis and the Mississippi Delta. "There's fewer and fewer real-deal places to go and hear the real stuff," he says.